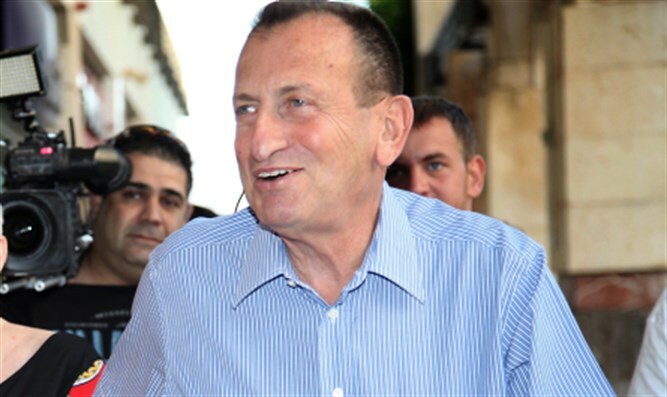 Tel Aviv Mayor Ron Huldai attends rally for Jaffa theater facing cut in subsidies after hosting event honoring terror-supporter. Hundreds of people, including Tel Aviv Mayor Ron Huldai, rallied at Jaffa's Arab-Hebrew Theater Friday. The Arab-Hebrew Theater is facing a cut in the state subsidies it receives after it honored Dareen Tatour, an Israeli-Arab poet who was indicted in 2015 for incitement to violence and support of terrorism. "This is a theater that does not oppose the State of Israel but loves it very much, so we will continue to support it," said Huldai. Shai Glick, who heads the human rights organization Bzalmo, blasted Huldai, telling Arutz Sheva that "it is very unfortunate that the mayor chooses to divert taxpayer money to fund events supporting terrorists. The Bzalmo organization appealed to the Attorney General, asking him to order the mayor to stop supporting the theater because it honors terrorists." Directors at the theater will be summoned for a hearing with representatives of the ministries of finance, justice, and culture after it hosted an event honoring Dareen Tatour, whose poems are considered incitement against the State of Israel. Finance Ministry legal adviser Asi Messing decided that the support for Tatour can be grounds for cutting the NIS 900,000 it receives annually from the state. According to Messing, honoring Tatour runs afoul of a law forbidding the state to give taxpayer money to any institution that incites to terrorism, racism or violence, that support violent struggle or terrorism against Israel, mark Israel’s Independence Day as a day or mourning or deny Israel’s right to exist as a Jewish and democratic state. “We will not allow anyone to incite to terrorism or harm the State of Israel. We will use all the authority provided to us by law,” vowed Finance Minister Moshe Kahlon.